PongOut | Geometry saves the Earth! The normal playing screen for PongOut. This level follows the idea that you have a safety net of BreakOut-bricks behind your paddle. 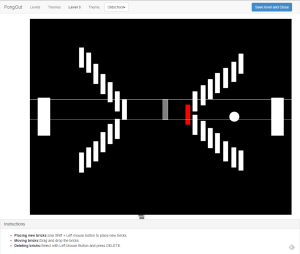 After blogging about the BreakOut/Pong-Crossover before (see blog posts one and two), this post marks the release of the game. I finally got around to pushing this one to a presentable state. In the middle of the project, I was severely stalled as I fell ill to feature creep, and one change seemingly led to another change. I finally decided to cut some things and get it finished. PongOut has a “play” mode and an “editor” mode. In the play mode, the chosen theme is used to determine which graphics are loaded, and the normal playing logic is used. In the edit mode, the elements are drawn in a very basic style, and you can add new elements and move and arrange them along each other. For example, the bricks are drawn using the following function. Here you can see the case distinction between the modes in the source code. 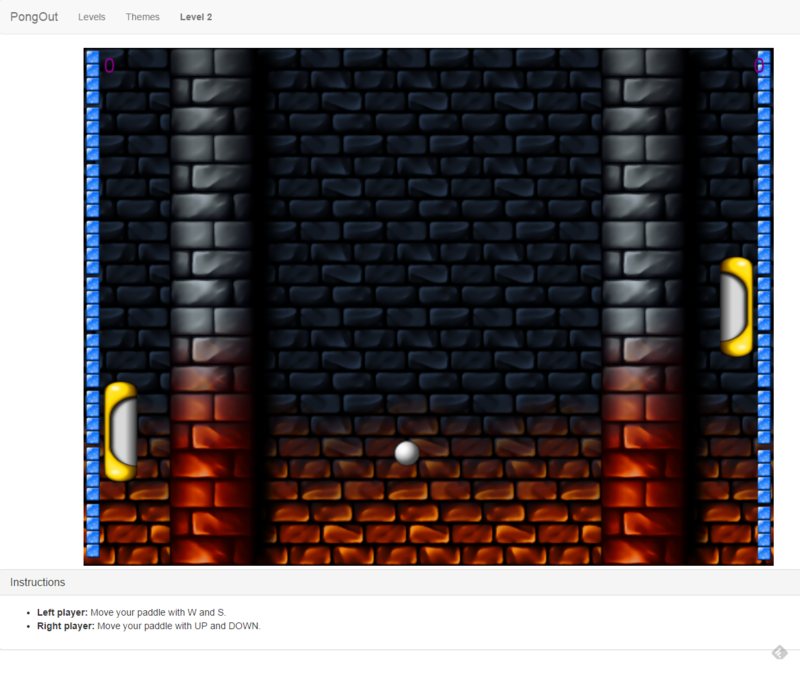 One more aspect that is handled as HTML 5 is saving the preview image of the level and saving the level data. The preview image is generated using canvas.toBlob. Since this is not implemented in all browsers, I used the method by Eli Grey which you can find here. I also made use of Eli Gray’s BlobBuilder. The level data is serialized to a json-file which is then uploaded to the server. During loading of the game, this file is loaded and parsed. There are many libraries used. For the look & feel, Twitter’s Bootstrap is used. Furthermore, jQuery and jQuery-UI as well as jQuery-fileupload have been used. 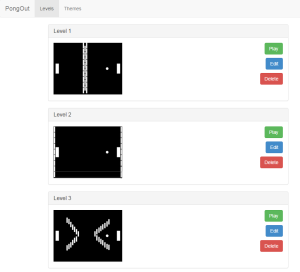 PongOut’s backend view of the available levels. It was definitely a good learning experience making PongOut. It’s interesting for me to see how I got some basic functionality up quickly, and then got into the feature creep-mode where the project was stalled. In future projects in my free time, I will strive even more towards focusing on the important aspects of the project and keeping it in a state where I might just release it. PongOut was started as an experiment. I implemented some functionality that would be required for a complete solution, but, the project is not intended to be production-stable. Especially, I have taken pretty much no regard to security ;-) So, instead of setting up a complete and insecure server, I have exported three levels as static web pages so you can try them out. If you are really interested in how the server works, feel free to clone the source code from github and set one up. The assets for level 1 were used from OpenGameArt, “Breakout Graphics” by Scribe and “Breakout Graphics” by Marcus. Source code for everything (server, editor, management) is available on github. RSS. I don’t know why I can’t subscribe to it. Is there anybody getting similar RSS issues?